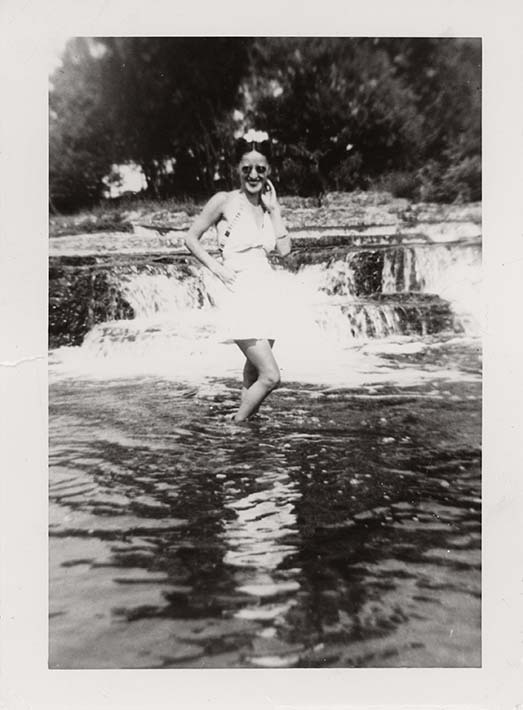 This is a black and white snapshot of Antoinette (Toni) Ciccarelli standing at a small waterfall. She is wearing a white two piece outfit: loose-fitting shorts and a mid-riff halter top. She is wearing dark coloured lipstick, round-rimmed dark sunglasses, white flower hair accessory, and a watch. She is posing with one hand on her hip and the other hand touching the side of her face. She is smiling at the camera. The background shows trees framing the small water fall. This was taken on the same day as DICEA2010.0001.0030.